Chicken supreme is actually a cut of chicken, it’s the breast of chicken without the bone. As know in French, Suprême de Volaille. It’s not an actual recipe although it seems to have become one with some processed commercial food industries. 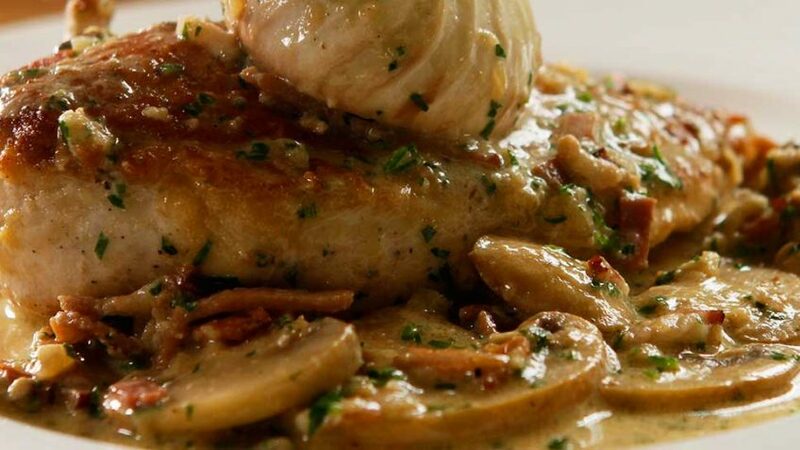 This chicken breast recipe has mushrooms, smokey bacon, shallots, garlic, white wine in a cream sauce. It’s simple to make and worthy of any restaurant meal. Make it on the stove using only one pot, or as in this case, one pan. Make this quick and easy meal yourself under 30 minutes. 2 cups chicken stock (unsalted) If salted only use 1 cup and do not season sauce. Prepare your ingredients – Remove any rind from bacon slices and chop into thin lardons. Peel and finely chop the shallots. Slice the mushrooms. Keep ingredients aside. Season the chicken breasts with salt and pepper. Both sides. Add a little flour to a plate and coat the each chicken breast in the flour, each side. Dust off any excess. Place a frying pan on low to medium heat, add enough olive oil to almost cover the bottom of pan. Place the chicken breasts skin side down. Cook until nice and brown. Cook gently and turn over once brown. Remove from frying pan and set aside on a plate or container in a warm spot. To the same pan, add more oil if too dry then the mushrooms, bacon, shallots and minced garlic cloves. Deglaze with the white wine and keep reducing. Once the wine is almost evaporated, add the chicken stock and reduce by half. Add the cream, salt and pepper and bring to a gentle simmer. Return the chicken breasts to the pan skin side up. Simmer very gently for approx 10 minutes. Chop the parsley finely and set aside. Place the chicken breasts on the hot serving plates. Continue to reduce the sauce until it has the desired thickness, add the chopped parsley, mix well and then pour over chicken breasts. 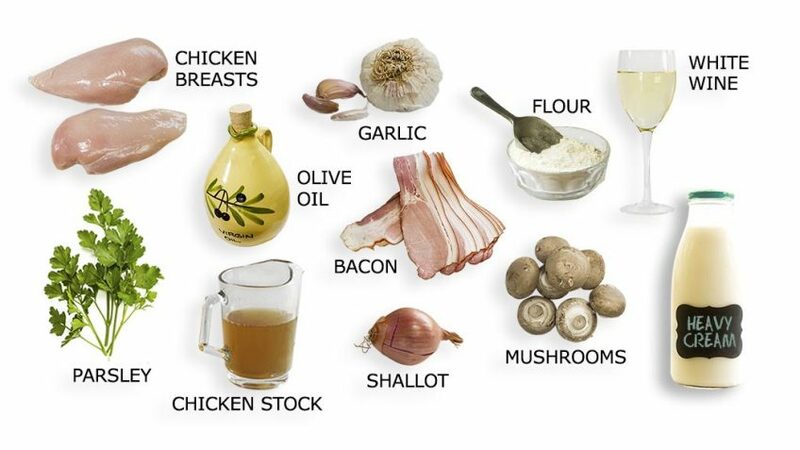 See my how to videos for "How to turn mushrooms".